This is to announce to all BitInvestors Club Members, Users And the general public that the Bitcoin and Altcoins HYIP online Investment project Demixmine (www.demixmine.com) Is no longer paying and is now a scam. This is an official warning from BitInvestors Club to Quit using this site, Sending referrals or preaching it to friends and family. We officially sent a notice apart from members complaints to the support and yet we didn't get a positive feedback which is an indication of the end of the road for demixmine. 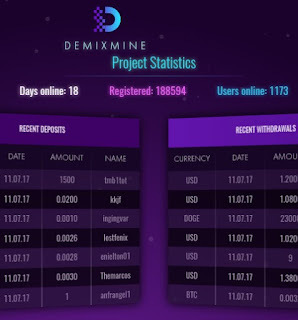 Demixmine offered profitable investment services and was over 20Days old before closing down. If you feel otherwise or think this news is real kindly drop a comment and save numerous people worldwide who intend investing on demixmine. We remain the best in the industry! Thanks for reading and welcome to BitInvestors Club.